The University of Windsor, Great Lakes Institute for Environmental Research (GLIER), seeks a highly motivated, well organized individual to execute a campaign to survey the agricultural land management practices in 10 small headwater catchments in southern Ontario. Job duties include: 1) design an appropriate sampling strategy to ensure a representative sample of land management practices across each watershed is achieved; 2) organize community events to promote and disseminate project information; 3) coordinate, procure, and manage services from qualified specialists such as Certified Crop Advisors or Conservation Authority personnel to administer farm-operator surveys and appropriate laboratories to perform soil testing; 4) prepare, curate, and evaluate data gathered; and 5) organize and attend meetings between various non-governmental organizations, Conservation Authorities, academic, and government researchers. Applicants must have a valid Ontario driver’s license. Applications will be reviewed starting December 15, 2016 and will continue until the position is filled. Environment and Climate Change Canada is calling for proposals to the Great Lakes Sustainability Fund. The deadline is January 16th 2017. 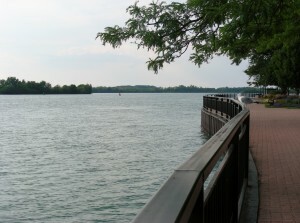 Priority for GLSF funding will be given to projects that directly contribute towards the completion of necessary remedial actions and beneficial use impairments identified in the Detroit River Canadian Cleanup’s most current work plan. If you have an idea for a restoration project in an Area of Concern and would like more information about funding opportunities, please contact the GLSF at glsf@ec.gc.ca. If your organization intends on applying for a GLSF grant for work in the Detroit River Area of Concern, please contact Gina Pannunzio (pannunzio@detroitriver.ca) by December 7th in order to have it reviewed by the Steering and Implementation Committee. Visit the IBA Canada website to learn more about the IBA Program, Caretaker Network, and how to get involved. 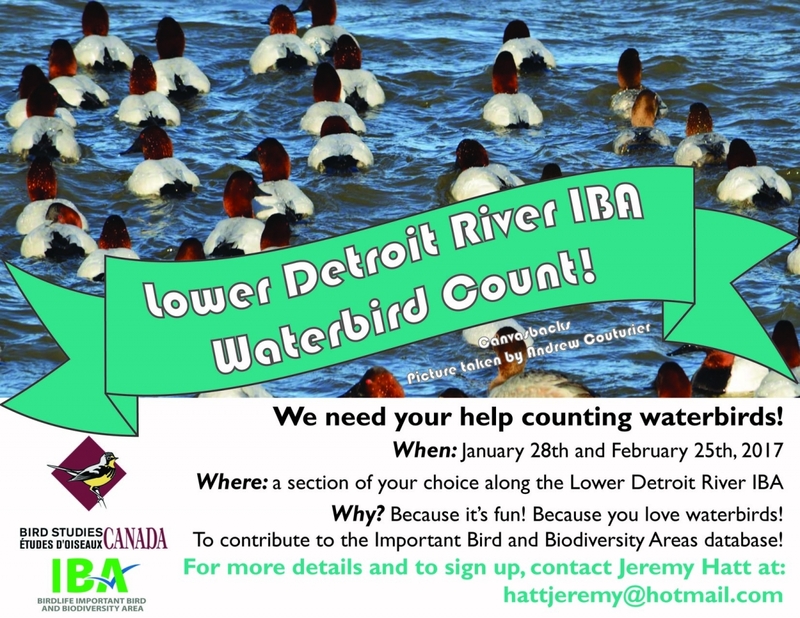 There will be two waterbird count events in the Lower Detroit River IBA this winter on Saturday January 28th and February 25th 2017. The activity will consist of two mornings of identifying waterbirds (mostly ducks) on the river in pre-determined locations. More details will come as we get closer to the date. The ‘Christmas Bird Count‘ (CBC) is conducted in over 2000 localities across Canada, the United States, Latin America, and the Caribbean.Christmas Bird Counts are conducted on any one day between December 14 and January 5 inclusive. They are carried out within a 24-km diameter circle that stays the same from year to year. These bird observations have been amassed into a huge database that reflects the distribution and numbers of winter birds over time. Birds are indicators of the overall health of our environment. As well as adding an exciting and fun event to the holiday season, the Christmas Bird Count provides valuable insight into the long-term health of bird populations and the environment. In September 2009, Lake Sturgeon were listed as threatened for the Great Lakes – Upper St. Lawrence and Northwestern Ontario populations and as special concern for the Hudson Bay – James Bay population. There is a ban in Ontario to commercially and sport fish Lake Sturgeon. We’re seeing a comeback in the Detroit River population, and have put effort into creating habitat for the gentle river giant.